The field trip group visits roadcut exposure of the famous t-marker, in the Grand Rapids Uplands. The t-marker (mostly represented by the red layer in this image) is associated with the HICE (Hirnantian Isotopic Carbon Excursion), indicative of the time interval just before the Ordovician-Silurian boundary. The last few months have been a bit of a blur, with many travels fitted into the summer and autumn interval. 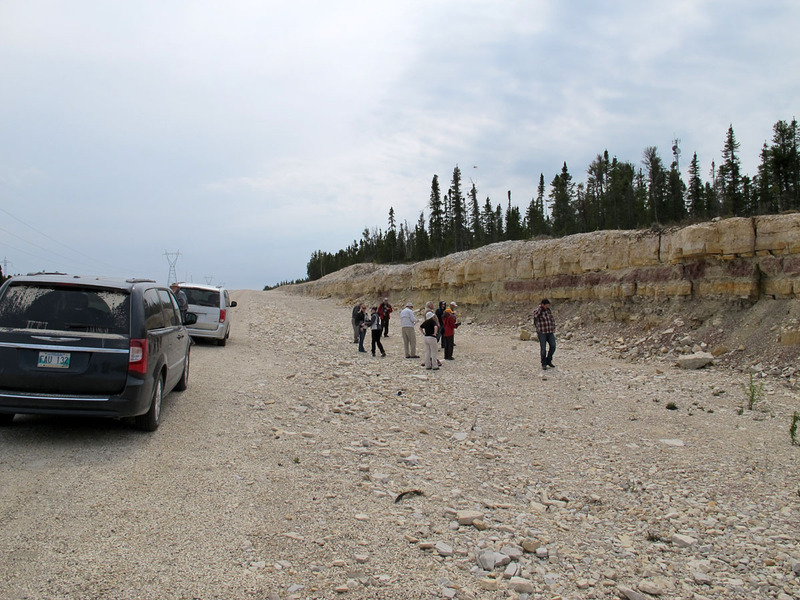 The prior months were a blur of a different sort, as a group of Winnipeg geologists scrambled to assemble the essential components of GAC-MAC Winnipeg 2013, the annual meeting for Canadian geoscientists. In addition to a variety of presentation sessions (including one I wrote about here a few months back), there were also several social functions, and some well-attended field trips. The field trip guidebooks have recently received online publication, and free downloads can be found here. I had the pleasure of being involved in the organization of two field trips (I can describe it as a pleasure now that the scramble of producing them is long past). One was a mid-conference trip on the geology of the Manitoba Legislative Building, on which I collaborated with Jeff Young from the University of Manitoba. 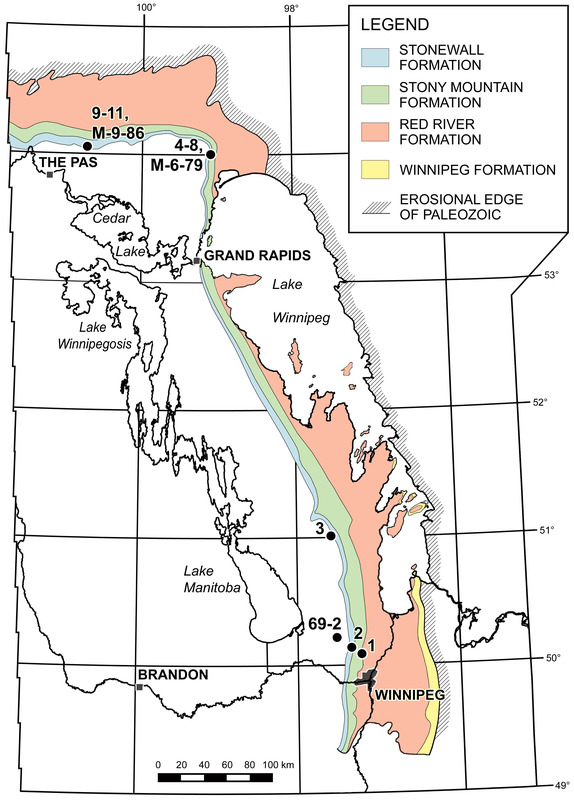 The other was a much larger-scale event: a three-day tour across the Ordovician-Silurian boundary, from the Winnipeg area all the way to the Grand Rapids Uplands and Cormorant Hill. This second trip was led by Bob Elias (also U of M), with input and support from several of the rest of us. As expected, Bob did a stellar job of organization and guidebook assembly, and the entire trip ran within ten minutes of schedule throughout! We took a delightful group of about a dozen people, representing a great variety of geological backgrounds (and, as it turned out, geological opinions). This geological map of Ordovician formations in the Williston Basin outcrop belt of Manitoba shows the locations of field trip stops (1-11) as well as comparative core-holes (drill holes) (map is based on Corkery et al., 1994; McCabe and Bezys, 1998). Starting from Winnipeg we visited Stony Mountain and Stonewall just north of Winnipeg, then stopped at a site in the Fisher Branch area before really heading north to spend the night at Grand Rapids. Even though it was the end of May, there was still ice to be seen on the lake. Nevertheless, the weather gods were cooperative and our weather remained at least bearable the next day, as we moved quickly through a series of sites in the Grand Rapids Uplands before hitting the road again, covering about 320 kilometres to The Pas. Staying at the very pleasant Kikiwak Inn at Opaskwayak Cree Nation, some of us even managed a late evening visit to the casino, though fortunately we also managed to avoid any actual gambling. The final day saw us visit a few sites at Cormorant Hill, where the succession of strata can be correlated with that in the Grand Rapids Uplands. A few brave souls even agreed to pose for photos on the fearsome feral couch that has lurked above the roadcut there for some years now. Then we were on the road again and back to Winnipeg, arriving near nightfall after a total trip of some 1700 km! The guidebook and trip planning involved substantial work from students and former students, notably Matt Demski and Lori Stewart, along with some able assistance from Ed Dobrzanski at the Manitoba Museum, and of course we also made considerable use of the conodont biostratigraphy of Godfrey Nowlan.